We mentioned that the categories of Tawheed that are well known are three categories of Tawheed that Ahlus-Sunnah speak with, and have spoken with for many centuries. These three categories have been derived and established from the words of Allah (ﷻ) in the Qur’an and from the Sunnah of Allah’s Messenger (ﷺ). As mentioned, there are people who only accept Tawheed to be just one category, the category of Tawheed Ar-Rubboobiyyah. They do not forbid the one who worships at the graves because they say that he has not violated the Tawheed Ar-Rubboobiyyah, because he has not claimed that the dead one in his grave is the Creator or the Sustainer of the beings. So, to them, Tawheed is a singular category. This is well known and something that is established in their books. As for their position on the names and attributes of Allah, as far as they are concerned, and they have written in their works, well known for centuries, they say that whoever affirms the names and attributes of Allah has resembled Allah to His creation. They do not accept that it is possible to affirm that which Allah has said about Himself in the Qur’an or that He has described Himself with. Ahlul-Kalām, as they are known, negate affirming the names and attributes of Allah. Those people of theological rhetoric (Ahlul-Kalām), who interpret the Qur’an (and the names and attributes of Allah) according to their own logic and their own rationale, come under various categories. They are the Jahmiyyah, they are the Mu’tazliah, they are the Ashā’irah, they are the Matureediyyah — all of these sects negate Tawheed Al-Asma was-Sifāt (the Tawheed of the names and attributes of Allah). They claim that it is not permissible to affirm for Allah what Allah has affirmed for Himself of His attributes of highness, of having ascended over His ‘Arsh and having descended to the nearest heaven in the last third of the night, and of the face of Allah and the hands of Allah. They say it is not allowed to affirm this for Allah, even though Allah has said this about Himself in the Qur’an. By negating, distorting or falsely interpreting the names and attributes of Allah, they claim to be purifying Allah of freeing of resemblance to the Creation. Tawheed, to them, is limited to Tawheed Ar-Rubboobiyyah, the Tawheed of Allah’s Lordship and Allah’s actions only because they do not accept the concept of the Tawheed Al-Uloohiyyah, which is the Tawheed of Ibādah for Allah alone, and they don’t affirm the names and attributes of Allah which is the Tawheed al-Asmā was-Sifāt. They disregard the other two categories of Tawheed and they criticise and refute those who divide Tawheed into three categories. So much so, that a present-day writer from amongst them said that the division of Tawheed into three categories is tantamount to the trinity of the Christians! Their insolence has reached such a point that they have resembled the division of Tawheed of Allah (ﷻ) into three categories to the religion of the Christians, where they divide the Allah into three gods: the Father, the Son and the Holy Ghost. They mock the people of Sunnah and say that they have made a trinity within Islam, and Allah’s refuge is sought from such attacks against the people of Sunnah. There are individuals in this era who have divided Tawheed into four categories. So, there are those who say Tawheed is only one category, then there comes another group who have gone to exaggeration. The first group have fallen into neglect by only allowing one category of Tawheed. The other group has gone beyond bounds and divided Tawheed into four categories. They say that Tawheed is in four categories: Tawheed Ar-Rubboobiyyah, Tawheed Al-Uloohiyyah, Tawheed Al-Asmā was-Sifāt and Tawheed Al-Hākimiyyah. They say that there is a Tawheed of Allah’s Lordship, the Tawheed of Allah’s worship, the Tawheed of Allah’s names and attributes and the Tawheed al-Hākimiyyah – the Tawheed of Allah’s ruling, or Allah’s rulership and Allah’s judgment. These they found upon the assumption, which is the same misconception that many people have, that the division of Tawheed is a mere matter of terminology, merely tradition and it is not connected to the textual proofs. There is no harm, as far as they are concerned, in increasing upon the three categories. They have made the same mistake as many people make, believing that Tawheed is merely an issue of terminology and that the number of categories does not matter. But, in reality, the affair of the division of Tawheed into three categories can only be seen through these categories, there is no fourth. There is no reduction or increase because anywhere Allah (ﷻ) speaks about Himself in the Qur’an, and He explains the affair of Tawheed, He does so in one of these three categories, and no more. So, it is said to such a person who divides and adds to Tawheed, that this division is not merely invented terminology, rather, this categorisation refers back to the Book and the Sunnah. When the Salaf categorised Tawheed into three categories, they established it from the Book and the Sunnah. As for Tawheed al-Hākimiyyah, the Tawheed of the Judgement of Allah, then it is true that it is obligatory to judge by the Shari’ah of Allah (the Most High), it is the Law of Allah that holds primacy, and judging by it enters into Tawheed al-‘Ibādah. To judge by that which Allah has revealed is obedience to Allah, the Mighty and Majestic, and worship of Him. The Salaf did not omit Al-Hākimiyyah or Judgement to Allah, nor did they neglect it, but it comes under the existing categories of Tawheed. The Salaf used to hold that every servant is to judge by that which Allah has revealed, the Hākimiyyah of Allah, and, by doing so, he has established the worship of Allah. That is because it is from worship and obedience to Him, by judging in accordance to His Shari’ah. It is not an independent or separate category. Otherwise, that would necessitate that a person would make Salāh into a category from the categories of Tawheed. Likewise, Zakāt, fasting and Hajj and every type of worship would be given an independent categorisation of Tawheed, claiming that Salāh is only for Allah and Zakat only for Allah — just as with Al-Hākimiyyah because they say that the hukm (judgement) is only for Allah. We know that all of these affairs: Al-Hukm, the Salah, the Zakat, the Sadaqah, the Sawm and Hajj are for Allah anyway, so why not turn them into categories of Tawheed?! When a person judges by what Allah has revealed, he has worshipped Allah. When he performs the Salah for Allah, he has worshipped Allah. So, therefore, it comes under the category of Tawheed al-‘Ibadah (the Tawheed of worship for Allah alone). Otherwise, every type of worship would be given a different category and there would be no end to it. This is clearly mistaken. Rather, all of the various types of worship fall into one category; every act and every type of worship fall into one category and that is the Tawheed al-Uloohiyyah (i.e. ‘Ibādah). This includes all types of worship and excludes that which is not considered to be worship. They are mistaken in adding a fourth and a fifth category and in saying that there are more than three categories of Tawheed. Some have claimed that there is such a thing as Tawheed al-Mutāba’ah, the ittibah (following) of the Messenger (ﷺ) and this is also an error. Following the Messenger of Allah is right and proper, however, following the Messenger of Allah (ﷺ) is from the binding necessities of Tawheed. For this reason, the testimony, Lā-ilāha-illallāh’ is not correct with the testification that Muhammed is the Messenger of Allāh, so from the necessity of the testification of Tawheed for Allah, is the testification of the Messengership of Muhammad (ﷺ). This is from the necessities of Tawheed, it is not a separate, independent category from the categories of Tawheed. You find some authors who say that Tawheed is four: Tawheed ar-Rubboobiyyah, Tawheed al-Uloohiyyah, Tawheed Al-Asmā was-Sifāt and they also add Tawheed Al-Mutāba’ah, meaning singling out Muhammed (ﷺ) alone to be followed. They have added this fourth category. Furthermore, there is another response to their adding Tawheed Al-Mutāba’ah (ittibā’ of the Messenger), and that is that whomsoever violates Tawheed, from the well-known three categories of Tawheed, he is a Mushrik (polytheist), one who has committed Shirk with Allah. But, the one who violates Al-Mutāba’ah of the Messenger, does not follow him, is not a Mushrik, he is an innovator (mubtadi’). So, therefore, the one who violates ittibā’ (following the Prophet) is an innovator. The one who violates Tawheed, he is a Mushrik. So, this is an error: Categorisation of Hākimiyyah into a separate category is a mistake, and this is something that all of the scholars have mentioned; from them Shaykh Abdul-‘Aziz Ibn Bāz, Ibn ‘Uthaymeen, Al-Albani, Al-Fawzan, Rabee’ Ibn Hādi, Ahmad An-Najmi, Muqbil Ibn Hādi etc. 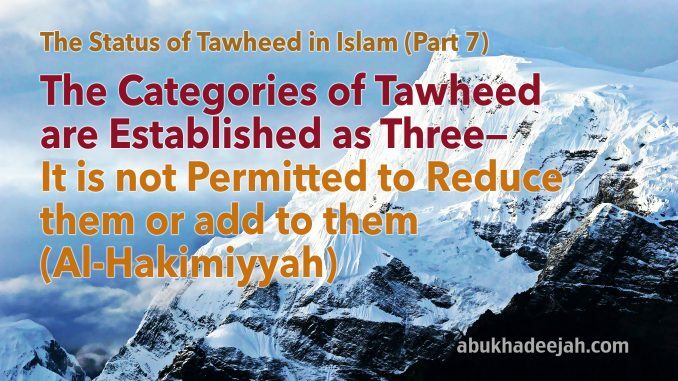 All of them repudiated those that claim that Tawheed Al-Hākimiyyah is the fourth category. There are those who made ijtihād and said that there is Tawheed al-Mutāba’ah, and that is a mistake and they are wrong. So, these are the various sayings of those who contradict Ahlus-Sunnah wal-Jamā’ah in the categorisation of Tawheed. They are either being excessive or negligent. So, let us stick to that which the Salaf used to know and that which we know to be correct from the Qur’an and from the Sunnah, and that is that Tawheed is of three categories, and we shall prove that through the explanations of various verses of the Qur’an, inshā’-Allāh.